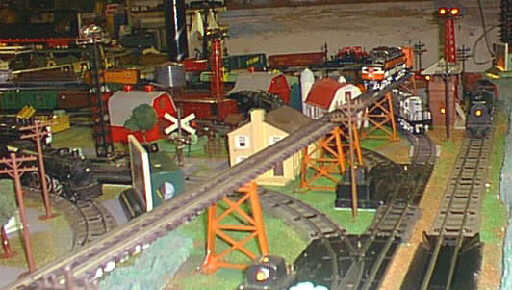 Photos of Bob's American Flyer layout. The Layout is currently approximately 15' x 35' and basically still under construction. Jim and Eric, my two son's and I began this version of the layout two years ago.I am 2nd generation American Flyer, they will be third generation with basically the same trains. The base of the layout is 7/16" particle board, sealed with shellac on both sides, using 2 x 4 on 16" centers as framework support. The grass and earth are good old LifeLike Earth and Grass glued with a 30/50 mixture of white glue, painted in some areas with latex paint (Greys and Browns) and then sealed with Hairspray. Operation of Three trains at once is common. The inside loop takes two complete trips around the layout for the completion of one revolution. The outside loop runs independently and follows the L shape of the layout. Crossover switch tracks are available to transverse from the inside to the outside,and also escape tracks. We operate all the engines and rolling stock we have and still enjoy "racing" each other through the turnouts! 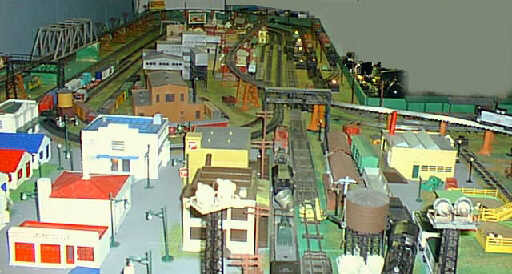 Main Street with a 283 pulling a 'work train' on the siding, a Billboard, crossing Sign and Plasticville Buildings. From the mountain showing the New Haven EP5, GM Demonstrater and the 290 Steamer. Looking down the pike via Main Street. 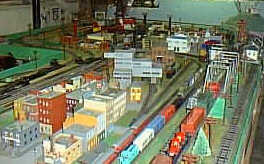 Plasticville buildings and a 302 and 290 apporoaching. At the tunnel GM Demonstrator and 290 race for the straightaway after exiting the tunnel. The EP5 travels on the elevated portion. 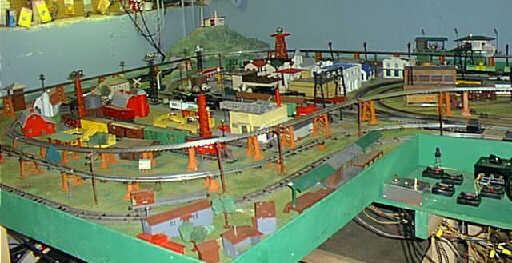 resides in the center part of the S layout. 'Waiting Wall' is the off layout storage and display area. 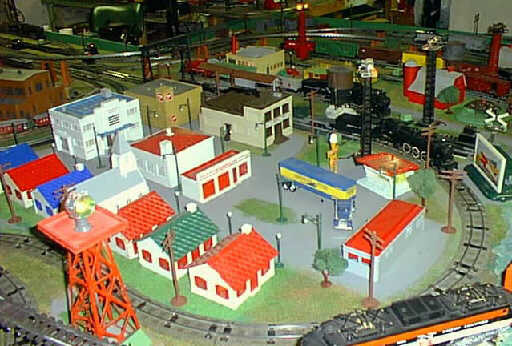 Trains are rotated from top to bottom on and off the layout. Top shelf is a Western Pacific ABA with it's cars. Shelf 2 is my Dad's original 312 Set with the Tuscan 651, 718, 650 and 654 and 740. Shelf 3 is a 312 AC with the 718, 650's in Hunter Green. Shelf 4 is for the Atlantics, 300, 307, 303 and a 740. Shelf 5 is some misc. rolling stock a 21165, and a 301.